The free option of Exit Adviser would be most useful for those interested in rough estimates on their company’s value. The simple calculation of discounted cash flow is not a very reliable measure to use for company valuation. How to use Exit Adviser? 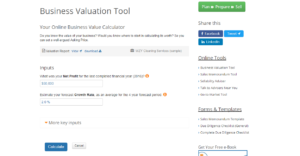 The freely accessible part of the Business Valuation Tool is clear and extremely simple to use. It does not require any registration prior to use. 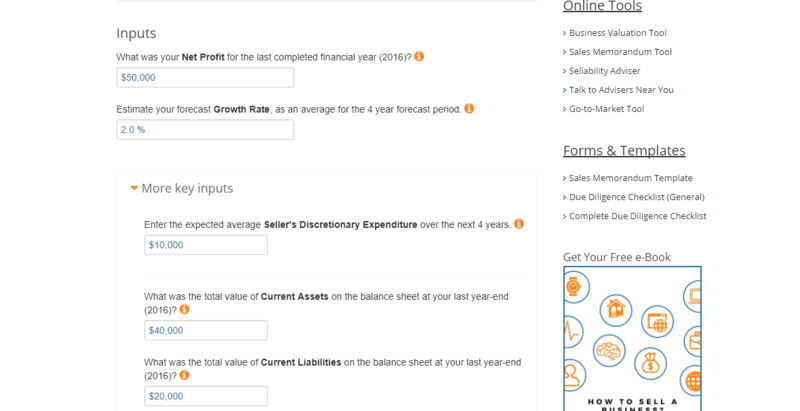 The user only needs to fill in the latest figure for Net Profit and their estimated Growth Rate for a four year period. Additionally, it is possible to fill in the expected average Seller’s Discretionary Expenditure, Current Assets and Current Liabilities to generate more precise results. This may be enough for some users, but for others, this is a way too limited approach. Additional input data can be given to the company valuation calculator to increase the accuracy of the DCF calculation. 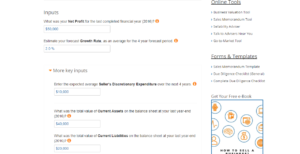 As result, the user gets calculations showing the suggested Asking Price, the result of Discounted Cash Flow calculation and a table indicating the sequence of calculations. If you’re interested in the extended version available for purchase, you can read our full review of ExitAdviser.